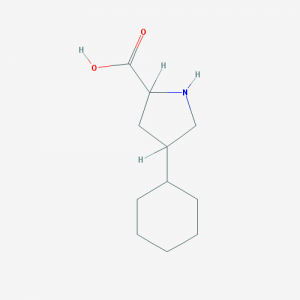 This is streptokinase. It was first isolated from bacteria in the 1930s and in the lab was shown to breakdown blood clots (by converting plasminogen to plasmin). When a purified version became available in the 1950s there was great interest to find out if it might increase survival if given after a person had suffered a heart-attack. This resulted in the first randomised trials being undertaken at the end of the 1950s, so what did they show? If streptokinase was given after a person had a heart-attack was survival increased? So, by way of an example, let’s say a trial is done and the overall result is a 25% improvement in survival after a heart-attack for those patients given streptokinase compared to placebo. This equates to a relative-risk of 0.75 (and is shown as point A) on the plot above. 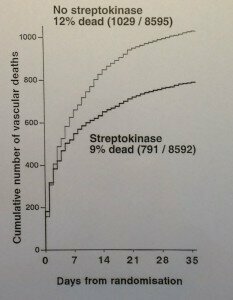 If the benefit of streptokinase was larger, say 50% improvement in survival then the relative risk would be 0.5 (shown as point B) above. The line at 1.0 above is where the result shows no effect of the treatment compared to placebo (shown as point C). The further the result is to the left the larger the size of the observed benefit of the treatment. By contrast, if the result of the trial was a 25% increase in death in patients treated with streptokinase compared to placebo then the relative risk would be 1.25 (shown as point D) above and the further to right the larger the observed risk of the treatment. 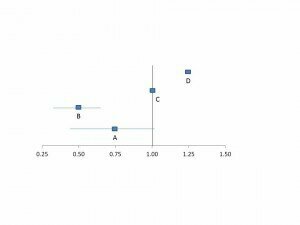 Now, the final bit relates to statistics, and what you will see for the results of the individual trials is a square point that represents the average result of that trial along with the error lines. In this example, the error lines show the 95% confidence interval, which means that we can be 95% certain that the actual effect is somewhere on this line. The longer the line, the less reliable the result (in the example above, the error line for point A is longer than B so the result is less reliable). Finally, if the line crosses one (as it does for point A) we can’t reach any reliable conclusion about whether the treatment results in benefit or harm, that is the uncertainty about the effect of the treatment persists. What’s clear from these previous trials shown above is that we remained unclear as to the benefit or hazards of treating heart-attacks with streptokinase (note the length of the error lines for most of the trials and how they cross 1.0), so the result was that the majority of patients who had a heart-attack did not get treated with it. Fortunately, in 1985, a young doctor, Salim Yusuf, working in Oxford with Professor Peter Sleight combined the results of all of these individual trials (using a statistical technique called meta-analysis) and showed that treatment with streptokinase resulted in a highly significant 22% reduction in death (in the figure above this is shown as the diamond shape at the bottom). Some doctors will have taken note of this, but the majority didn’t so most patients were still not treated with streptokinase. 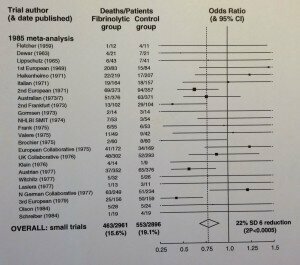 However, the meta-analysis led Sleight to have dinner with Richard Peto and one of us (Rory Collins) and the idea for the ISIS-2 trial was born (I flippantly want to write that they used the ICH-GCP guideline in designing the trial, but only as a table-mat, but alas it would be still be another decade until the guideline would appear). The effect of streptokinase was now clear, rapid treatment with it after a heart-attack reduced death by 20-25%. Finally, this clear result resulted in a rapid and lasting change in the treatment of heart-attacks. A UK survey showed that in 1987 only 2% of doctors gave streptokinase or similar treatments to patients after a heart-attack, but by 1989 (after the publication of the results of ISIS-2) this had increased to nearly 70%. So, to reliably assess the effects of treatments requires much larger numbers of participants to be randomised than is generally appreciated. The clear results from these mega-trials at the end of the 1980s resulted in rapid and lasting changes in clinical practice that avoided at least 10,000 premature deaths each year, but what also needs to be acknowledged is the inadequate size of of the earlier trials can now be seen to have been the cause of some hundreds of thousands of unnecessary deaths. I presented these results last year at a European forum on clinical research to make the point that ICH-GCP by focusing on things that don’t really matter diverts resources away from those few things that do matter and this means that uncertainties about treatments persist. An older physician in the audience got quite annoyed at me for saying this as he pointed out that the widespread introduction of randomised trials had only begun in the 1950s and, if a new treatment like streptokinase was developed today, we would have a clear result very quickly. Maybe he was right, we certainly wouldn’t have to wait 30 years to get a clear result, but what you won’t see in the ICH-GCP guideline is the core fundamental principle to reliably address the trial question. I see the results of this every month, when I chair a Research Ethics Committee, and regularly see trials presented that sacrifice this core principle of reliably addressing the study question by not randomising a large enough number of participants and instead waste resources on needless checks and other trial procedures all to be compliant with the ICH-GCP guideline. So, when we say that the ICH-GCP guideline allows bad trials to get done, that is an example of what we mean. If you have any comments on thoughts to share on this post please comment below.